Black Cats and Halloween: Good luck or cursed? If you have an all black feline friend, you probably should be cautious about letting him or her roam outside on October 31. 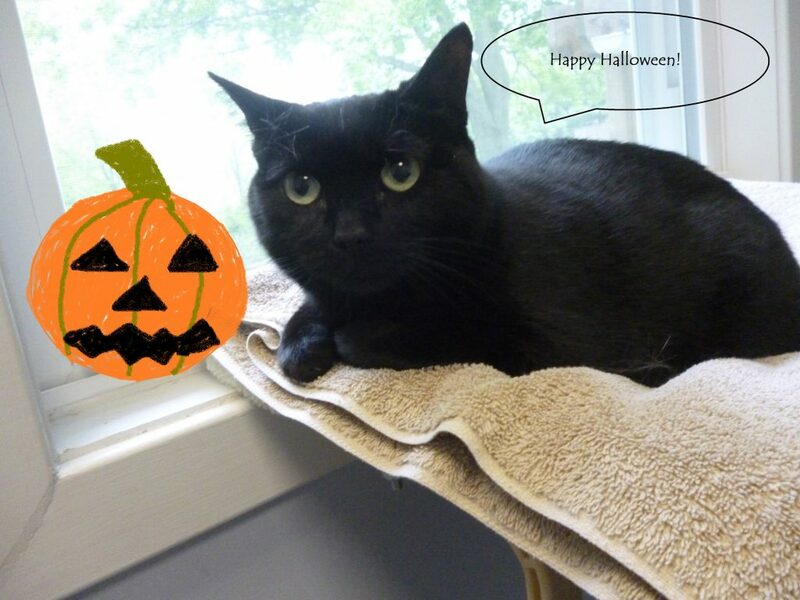 Black cats and Halloween have a history that is not always a happy one. In Puritanical New England, the Pilgrims thought that black cats had a close relationship with witches. And we all know they weren’t too fond of witches. A person caught with a black cat was severely punished or killed. Any black kitties running around loose at the time likely met with an unfortunate ending. But did you know that some cultures believe black cats are good luck? In Germany, some believe that black cats crossing a person’s path from right to left, is a bad omen. But from left to right, the cat is granting favorable times. In Scotland and many parts of the United Kingdom, it was believed that a strange black cat’s arrival to the home signifies prosperity. Sailors considering a “ship’s cat” would want a black one because it would bring good luck. Sometimes, fishermen’s wives would keep black cats at home too, in the hope that they would be able to use their influence to protect their husbands at sea. The view of black cats being favorable creatures is attributed specifically to the Egyptian goddess Bastet, the cat goddess. Egyptian households believed they could gain favor from Bastet by keeping black cats in their household. In the early 17th century, the English monarch Charles I, upon the death of his treasured pet black cat, is said to have lamented that his luck was gone. True to his claim, he was arrested the very next day and charged with high treason. Pirates believed that a black cat would bring different kinds of luck. If a black cat walks towards someone, that person will have bad luck. If a black cat walks away from someone then that person will have good luck. Conversely in the United Kingdom if a black cat walks towards someone, it brings good fortune, but if it walks away, it takes the good luck with it. If a black cat walks onto a ship and then walks off it, the ship is doomed to sink on its next trip. During the bubonic plague epidemic (the “Black Death”) in Europe in the 14th century, people believed the disease was caused by God’s wrath. To placate him, they burned women accused of witchcraft. According to some, various communities also killed off all their cats because of their association with witches. That made the situation worse because it allowed the rat population to flourish. The epidemic ultimately killed 200 million people. Today, our culture in general tends to be less believing in superstitions. However, there are still a few evil-doers who may want to harm black cats around Halloween, so many shelters won’t allow them to be adopted in the days leading up to the big night. And overall, black cats are more difficult to find homes for. Apparently a recent trend has been to abandon black cats because they don’t photograph well in selfies! So if you’re looking for a new feline companion, consider adopting a black cat. They can be just as loving as any other cat. And if black cats currently share your home, be sure to keep them safe this Halloween by leaving indoors.